Kidnap victim Ai Wu Yong demonstrates to Cavite police director Col. William Segun how he escaped from a subdivision in Barangay Sebastian, Imus, Cavite yesterday. 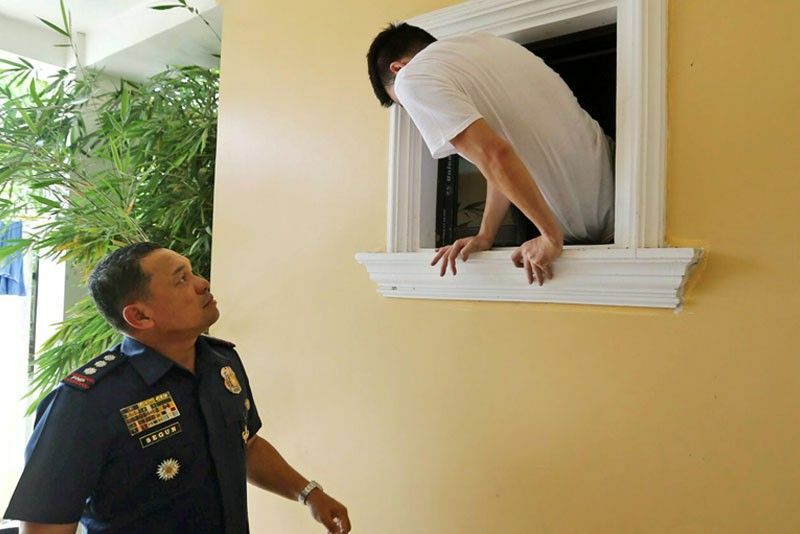 MANILA, Philippines — A Chinese man kidnapped by suspected members of a loan shark gang escaped from his captors in Kawit on Sunday. Col. William Segun, Cavite police director, said Ai Wu Yong, 27, was in handcuffs when rescued by police officers in Barangay San Sebastian at around 8:45 p.m. The victim said he escaped through an open window. A follow-up operation at a subdivision, where the victim was brought, led to the arrest of one of the suspects, 45-year-old Chinese national Teddy Lim. Ai told police he was kidnapped from a casino in Pasay City also on Sunday after he failed to pay the money he borrowed from the suspects. Maj. Richard Corpuz, Kawit police chief, said the suspects demanded P200,000 from the victim in exchange for his freedom. Corpuz said the suspects told Ai that he would have to pay an interest of P20,000 daily if he could not pay on time. A manhunt for the other suspects, two of them identified as Andy Tan, 31, and July Lee, 36, are ongoing.